like (with a similar situation possibly at Wadi al-Hammeh 27 and earlier Ein Gev I). During the middle phase at 'Ain Mallaha they decrease in size, comparable to PPNA structures in the Jordan Valley. One of the interesting developments is the presence of a bimodal size difference in domestic structures during the Harifian of the Negev and Sinai and the PPNA in the Jordan Valley. Such a pattern may also be present during the Early and Final Natufian of 'Ain Mallaha, although the sample size is too small for confirmation. This variation in intrasite structure size may imply either functional or social organizational differences. The PPNA in the western hills is much more varied and includes one site (Hatoula) with structures of equivalent size and shape to those in the PPNA of the Jordan Valley and one site (Nahal Oren) with a series of much smaller Structures. The major and significant change in interior area occurs between the PPNA and the PPNB of the Jordan Valley and adjacent highlands. Mean values for the PPNB are 2.2 times those of the PPNA of the Jordan Valley (where the largest structures of the PPNA occur). They are also considerably larger than the mean values for the Early Natufian of 'Ain Mallaha (the next largest mean floor area). A similar trend occurs during the PPNB at Beidha. The domestic structures of the initial two phases are considerably smaller than the PPNA of the Jordan Valley (closer to building size in the Negev). In phase C, however, building size increases dramatically, reaching a value almost comparable to that of other PPNB sites and considerably larger than the PPNA of the Jordan Valley. As mentioned, the PPNB structures of the Negev remain small. The second major trend entails the formal allocation and organization of interior space, and this changes dramatically over time. Although the small sample of structures predating the Natufian does not allow strong inferences to be made, it does reveal that structures were constructed and reused prior to the Natufian (sometimes with more permanent building materials) and occasionally included interior features. Hearths appear to occur primarily outside structures. Unfortunately a considerable time gap separates this sample from that of the Early Natufian. The structures of the Early Natufian in the Jordan Valley differ from their predecessors only to the extent that more permanent building material was used, and the relative frequency of structures and features within them. During the Early Natufian, the presence of hearths (both makeshift and more formally constructed) and other interior features (including stone bins) occur within many structures at sites in the Jordan Valley and western highlands. Notably, the large ramada-like structures included multiple hearths or multiple stone bins. At Hayonim Cave, hearths were discerned in half the small structures. The buildup of debris in structures is well documented at a number of sites and floors noted within this debris accumulation. Whether this indicates reuse after a period of abandonment and trash dumping, or relatively constant accumulation of debris in a living context (with occasional surfaces discerned due to the presence of features), or both is uncertain. Large stone mortars, stone slabs, and cup-mark stones within a number of structures are interpreted as in situ nonportable artifacts that provide evidence for recurrent processing of food resources within houses. Notably, many of the Harifian structures have stone slabs with cup marks. Throughout the Epi-Paleolithic there are examples where spatial patterns in the distribution of artifacts, including portable artifacts, within a single structure are suggestive of spatial patterning of domestic activities including food production and tool maintenance and manufacture. These activities are best documented at 'Ain Mallaha and Wadi al-Hammeh 27. One of the major questions that needs to be further addressed is, what behavioral processes created these artifact sets on the floors of buildings that lack evidence of catastrophic abandonment. For apparent caches of larger portable artifacts such as pestles, why did they not continue to be used? For smaller artifact classes and those that represent debris or by-products of activities, floor clusters may represent gradual accumulation of residue from the same events carried out in the same general locations that were not subjected to cleaning and secondary disposal. No major changes in the organization of interior space are discernible when the Early Natufian is contrasted with the PPNA. Hearths are documented in some structures but not all. In addition, they are not always formally constructed features but instead are makeshift. Other features, notably stone bins and large stones with cup hole or mortars, occur in some structures. 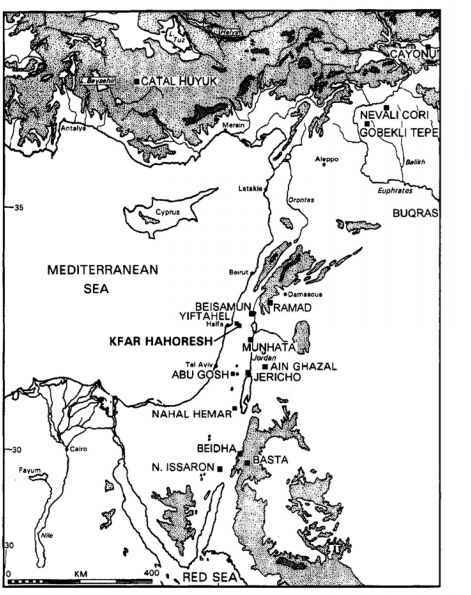 This is a trend that appears to have begun earlier, particularly based on the Harifian evidence (although we lack Late Natufian structures in the Jordan Valley area). As with building size, major changes are most notable during the PPNB. Unfortunately we lack evidence from the very onset of the PPNB to determine whether these changes are gradual or dramatic. Given the associated shift from round to rectangular building form, this change may not be gradual. No extensive use of formal subdivisions within structures occurs until the PPNB. Prior examples are infrequent (e.g., Netiv Hagdudbuilding 8). PPNB pier buildings of the highlands and Jordan Valley are characterized by a range of facilities and small compartments. Thus, the syntax is more complex than it was previously (depicted graphically as tree diagrams versus the simple paths ofprevious structures). The small subdivided interior spaces within pier houses were presumably for processing or storage. Hearths are almost always present within these structures and are an integral part of the interior plaster floors. At Beidha these changes occur during the PPNB as basements in the final phase were used for a variety of activities, including storage, food processing, and artifact production. These endeavors were very compartmentalized. Cooking and eating, entertaining, and sleeping presumably occurred primarily in the upper stories, based on the presence of hearths and a more open plan. One of the interesting regional trends is that in the Negev, despite the presence of small round structures in the PPNB, the structures are more elaborate than previous ones in the same area (although not as elaborate as the PPNB rectangular structures of the highlands and Jordan Valley in terms of the number of internal features, including the presence of nonportable artifacts).